Could Indonesia’s mega-fires return in 2019? - Unearthed Could Indonesia’s mega-fires return in 2019? Scientists are warning that 2019 could see the first major test of Indonesia’s new anti-fire measures, which have been criticised by some environmental groups for not going far enough. 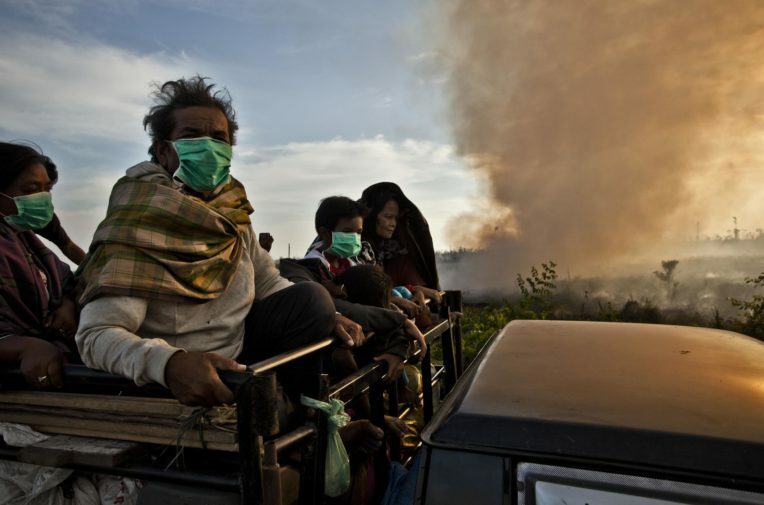 Three years ago dramatic forest fires in Indonesia released huge amounts of carbon into the atmosphere, causing more than $16bn of damage to Indonesia’s economy and leaving much of south-east Asia coated in a thick, toxic, yellow haze. Since then the government led by President Joko ‘Jokowi’ Widodo, has made a great show of introducing measures to prevent fires, which are overwhelmingly caused by human activity, like land clearing for agriculture and palm oil plantations. In 2016, President Jokowi announced a moratorium on developing on peatland and a raft of moves to protect rainforests. The Washington Post reported at the time that the developments “could be a major boon for both public health and the global climate”. Jokowi signed a three-year moratorium on new palm oil licenses last week. Fires have been less dramatic in recent years, but this may be in part down to natural changes in weather patterns. There are concerns about whether the measures taken by authorities are being properly implemented. This matters because researchers have told Unearthed that next year could see similar climate conditions to 2015, with an El Niño highly likely in the coming months, increasing the risk of fires in next year’s dry season. El Niño refers to a period of high ocean surface temperatures in the Pacific ocean, creating warmer temperatures in the surrounding region and affecting weather in countries from South America to south-east Asia. As this Nasa blog post sets out, in El Niño years, “rain that is normally centred over Indonesia and the far western Pacific shifts eastward into the central Pacific”, causing drought and increasing the risk of fires in the country. This is exactly what happened in 2015, when an unusually strong El Niño helped spark unprecedented fires in Indonesia. Use this map to see NASA satellite images of "hotspots" across the world from the last 24 hours. Katia Fernandes, associate research scientist at the International Research Institute for Climate and Society at Columbia University tells Unearthed at the moment there is a high probability of an El Niño this winter. However, both because of its strength, or lack thereof, and the fact that it is due to peak in the middle of the country’s rainy season, from November to February, the impact of the coming El Niño is unlikely to be as dramatic as 2015. Fires typically occur in the dry season, which peaks around September and October. This summer, some parts of the country have seen significant blazes, with Indonesia experiencing a similarly dry summer to Europe. This August, daily wildfire CO2 emissions from Indonesia were at the highest level since 2015, according to researchers at Copernicus CAMS Global Fire Assimilation System. In West Kalimantan, forest fires have caused air pollution and forced an airport in the city of Pontianak to close. It was reported in local media last month that four people died in fires in the region. Susan Minnemeyer head of GIS at Global Forest Watch, describes the situation in West Kalimantan as a return to “business as usual”, after two unusually wet summers. Robert Field, an associate research scientist at Columbia University, spends a lot of time studying the climate in Indonesia. “There has been some fire in 2018, but nothing like 2015,” he tells me. As Field sets out, “peat is the distinguishing factor with fires in Indonesia”. Much of the country is covered with the carbon-rich soil and agricultural development in recent years has had the effect of drying out this soil, making it more vulnerable to fires. This has huge consequences for the global climate. By October 2015, carbon emissions from fires that summer in Indonesia were on a par with Brazil’s annual emissions. Field says the fires in 2015 appear to have galvanised authorities into taking significant steps to address future fires, from investing in local fire services to establishing new agencies. Previously, volunteer forces and NGOs had done much of the firefighting, a practise that continues today. But for all the investment, Indonesia still faces the challenge of protecting the environment while maintaining a rapid expansion of industrial agriculture, led by the palm oil industry. Some argue that the government is not prepared for a repeat of the conditions seen three years ago. A recent article published by the environment site Mongabay about this summer’s wildfires argued that despite the authorities embarking on a major peatland restoration project, “the fires this year have sprung up in regions that have been prioritised for peat restoration, suggesting the government’s policies have had little impact”. At the same time, Indonesia’s top court is reviewing a lawsuit filed in 2016 by environmental activists calling on the government to pass regulations to prevent forest fires. The government is challenging the lawsuit, insisting that measures brought in since 2015 are adequate. This assertion is likely to get its first real test next year.